Choosing curriculum can be one of the hardest parts I've found to homeschooling. I always seem to think I have found what is going to work best for my boys and then they hate it or I hate the layout once we really get into it. We have made some changes to our curriculum this school year and what I have picked has been amazing to take place of what we were using! First up was Science. I had chosen the Cambridge Primary Science for both of my boys in level 4 and 6. The material was so dry and boring once we really got into it that I stopped using it pretty early on! We made the switch to The Good and Beautiful Science curriculum and I can't say enough good about it!! We decided to study Intro to Energy and Meteorology! We are loving Science now and plan to continue using it for the years ahead. Our next change was Spelling. Spellwell just wasn't a good fit for my boys. We also dropped Growing with Grammar as I felt it was just too much like busy work and not enough retention when my boys were using it. Next was the Maps and Geography it was too easy and my boys flew right through it. There was nothing really wrong with it they just found it to be too easy and not enough of a challenge. So you are probably asking yourself well why aren't you telling us what you chose to use instead for each of those. Most of the time you would need to find separate curriculum for each. 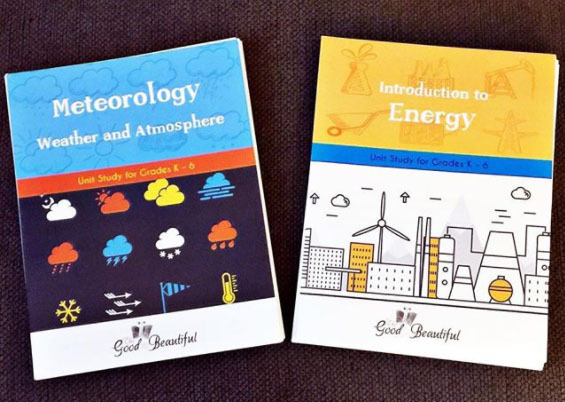 I was lucky enough to find that The Good and Beautiful offers Language Arts curriculum that includes; Reading, Writing, Literature, Spelling, Grammar, Punctuation, Vocabulary, Geography, and Art!! Yep it covers it all!!! So we only needed one book! And better yet Levels 1-5 are free downloads!! No I am not sponsored I am just LOVING this curriculum!!! So that's where we are at! The rest of the curriculum for History and Math has worked out really well!